If you've landed on this blog post having already spent a bit of time on other parts of this site, then you'll already be familiar with our tagline, or rather part of our tagline. 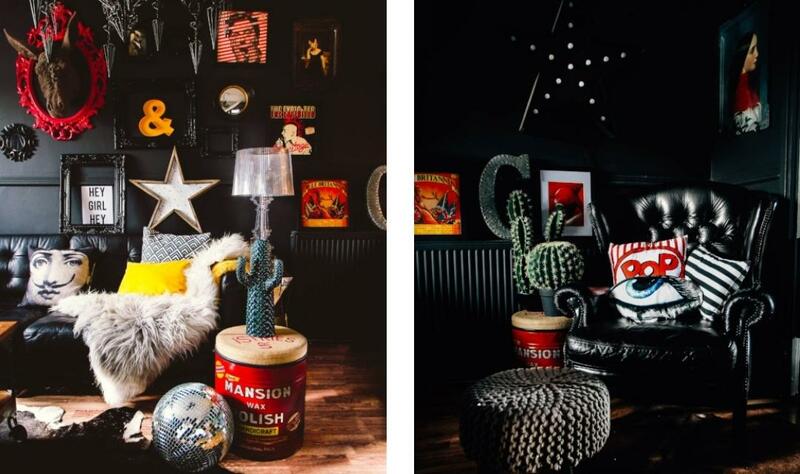 The bit that goes 'for dark, moody interiors with a quirky, playful edge'. We don't have that for any old reason. We have that because I really, really love a dark interior. I'm not really sure why. Maybe it's because I really love a dark, cosy pub, and try to recreate that welcoming, cocooning feeling in my interiors. Maybe it harps back to my brief stint as a teenage goth. Who knows? 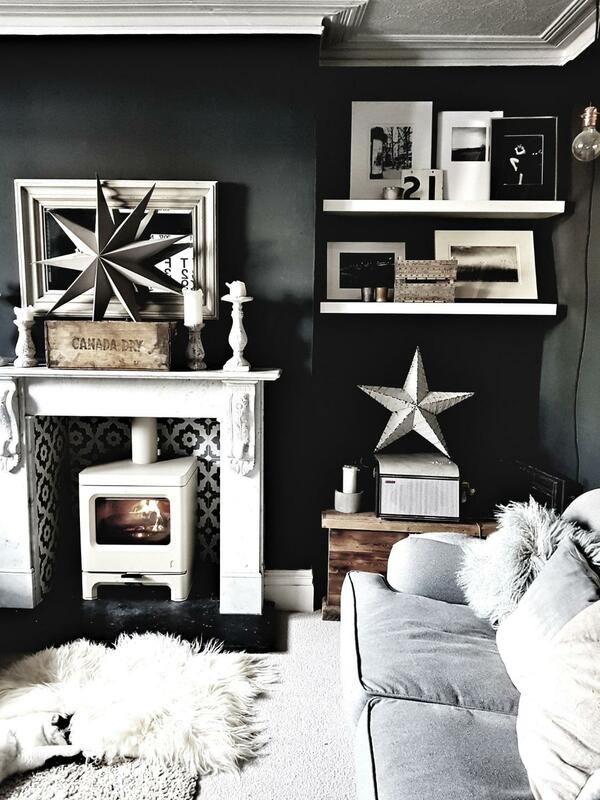 But for years I have been drawn towards dark greys, dark blues, dark greens and even black when decorating. For a while I thought it was just me. But then I discovered Instagram, and realised there's a whole tribe of us out there, who decorate our homes so that they feel like a big, warm hug. In more recent years it's even become something of a trend. First kitchen cabinets going dark, then bathrooms, and now living rooms, dining rooms, bedrooms, all moving over to the dark side. There's even a hashtag for it with #styleitdark. In my own home, I've gone dark in two rooms. 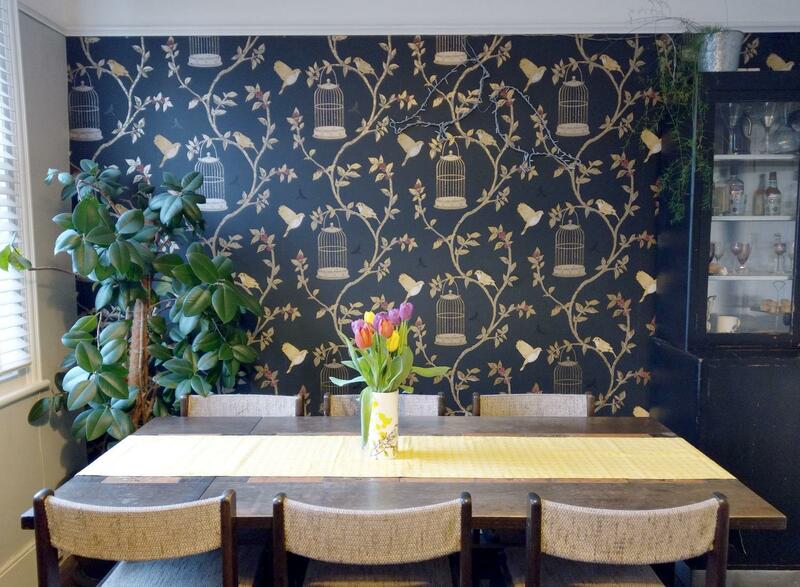 First, there's the use of the black and gold Nina Campbell wallpaper that I used in my living room, which you can read about here. Although being fairly early in my interiors journey when I did this room I was afraid to go too dark and so I kept the walls a light grey (if only I knew then what I know now...). 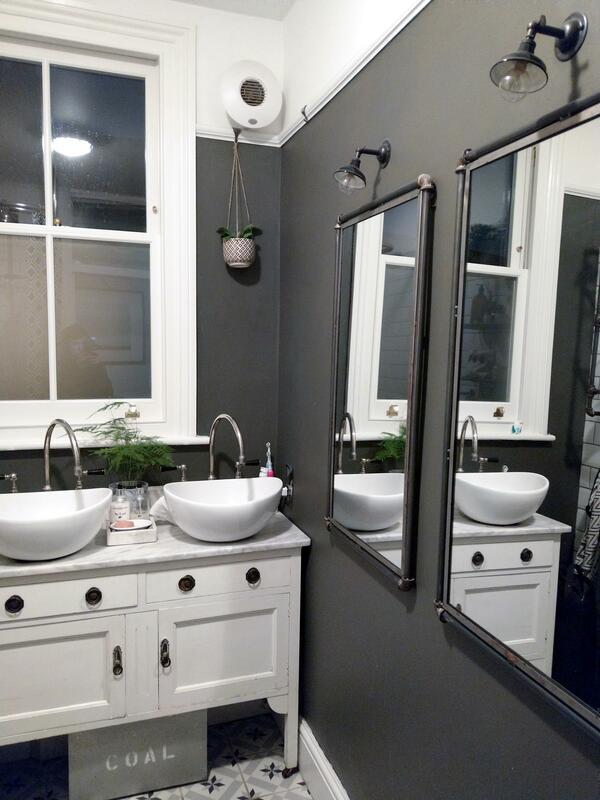 The most recent renovation was my bathroom, where I went very dark on the walls, using Bowler Hat by Dulux. It's my favourite room in the flat. 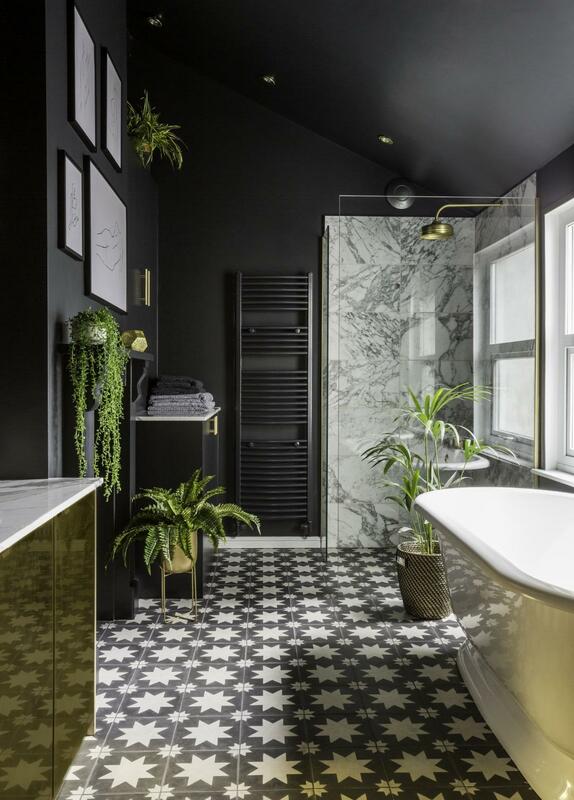 Another bathroom that has Bowler Hat on the walls, paired with white metro and tiles and dark grout belongs to interior's blogger Rebecca over at Malmo & Moss. A dark wall and a white metro is such a great look, although Rebecca has taken the industrial feel a step further than I have. 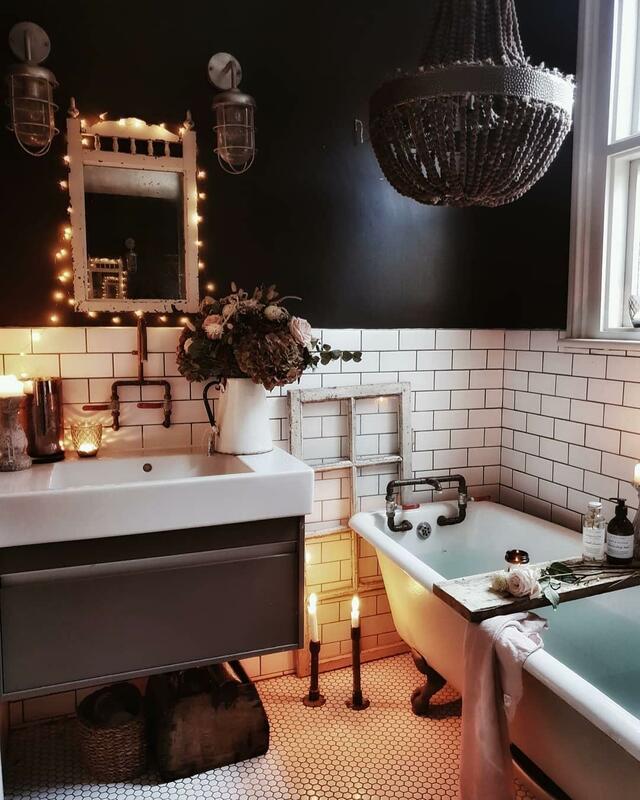 Much as I love my bathroom (and also Rebecca's) though, recently interiors blogger Jess, aka Gold Is A Neutral (and I agree wholeheartedly with her, gold is a neutral) revealed her bathroom reno, and my word is it good! It's dark - much darker than mine. She's also teamed it with loads of marble and brass. It's quite frankly the sexiest bathroom I've ever seen and makes me wish I could start mine all over again! Moving away from bathrooms and onto kitchens, and you can't really beat the design led kitchens from manufacture deVOL. 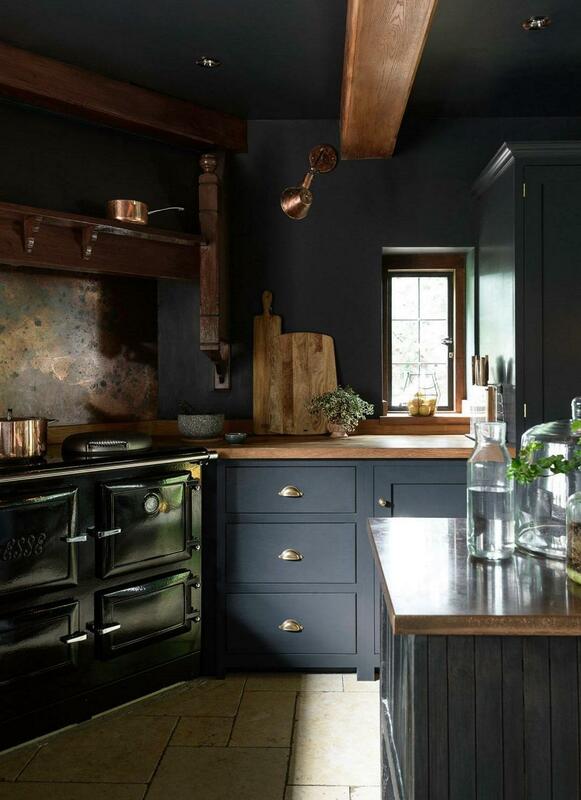 They of course do kitchens in all colours, but their exceptionally well designed, and well made kitchens really look stunning in the darker colours. Take this beautiful example of their Shaker style kitchen. The cabinets, the walls, even the ceiling is painted in the darkest midnight blue. Does it feel dark and dingy? No. Does it feel warm and coy and like the sort of place you'd want to spend an entire Sunday, cooking, chatting with friends, drinking red wine? Absolutely. Then there is the example of their latest cabinet range, with designer Sebastian Cox. It's a lighter blue than before, although still a dark shade, but the warm copper really lightens it, and it's just gorgeous. 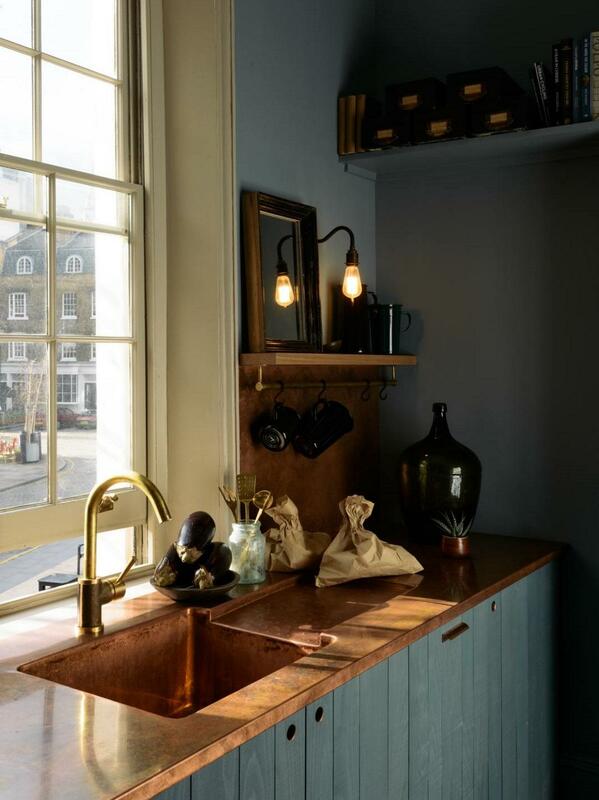 (Side note: I decided years ago i wanted a copper kitchen top after seeing it in a country pub and falling in love with. I'm a little bit pleased, but mostly quite a bit miffed that it's now becoming a bit of a trend and I still don't have one). Bedrooms are a room where a dark colour works really well. Some people like a light, bright, airy bedroom. I am not one of those people. A bedroom is a place to relax, and for me dark shades will always be more relaxing and restful than light ones. This is one of the bedrooms at One Mill House. The wallpaper is black and the bedding and curtains are dark grey. 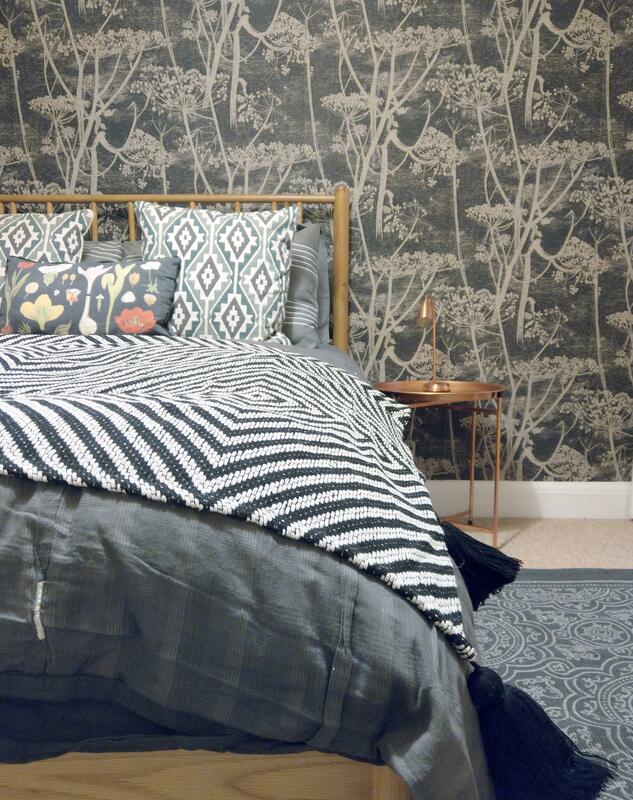 It's such a warm, cosy room, although the wallpaper pattern and the lighter carpet keep it feeling quite bright too. Ellie Cashman is a designer that does dark colours incredibly well. Her oversized floral prints really make a statement, and although there are lighter versions available, if you look at her Instagram feed you'll see mostly the floral patterns against the darker backgrounds. I these these work wonderfully in a bedroom, they're a bit feminine, but also very cool. 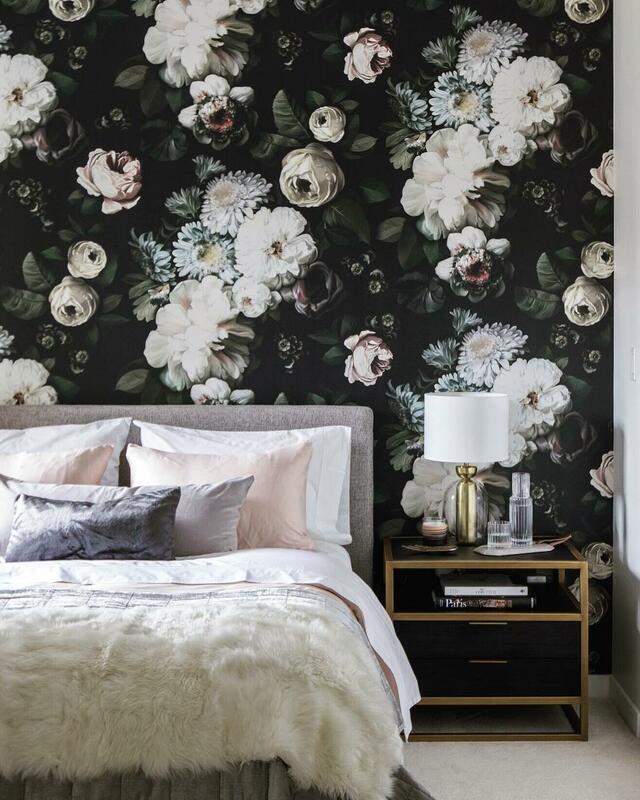 Here are two great examples from her Instagram feed with both the wallpaper and then a plain wall but floral accents in the cushions. Finally onto the living areas of our homes. Back to Malmo & Moss for this living room, which is painted in Farrow & Ball's Railings, something of a classic amongst dark wall fanatics. Ignoring the fact that her neice calls it the black living room, I think we can all agree that despite being a shade of almost black, it just doesn't look bleak. It looks gorgeous. The incredible Bert & May tiles definitely help though. 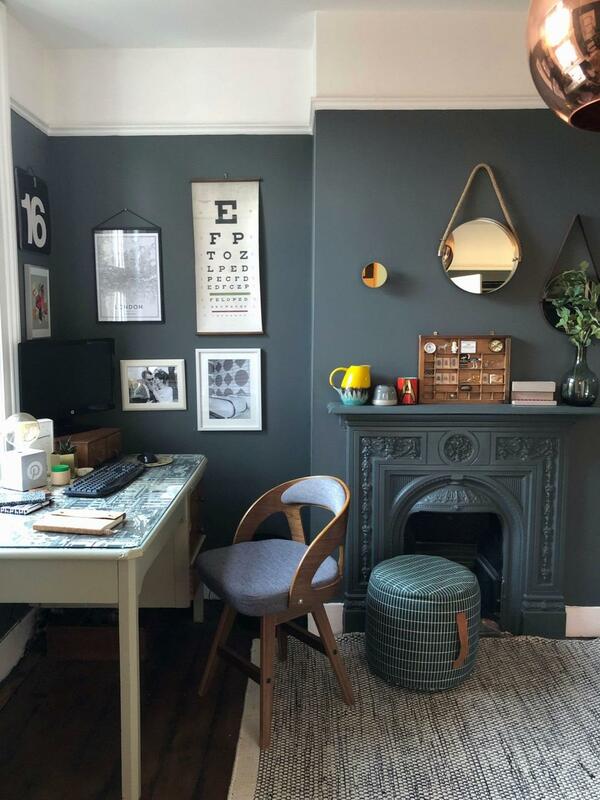 Another interior's blogger who has used Farrow & Ball to create a dark and moody interior, although this time with Downpipe rather than Railings, is Ruth at Design Soda. Now I'll be honest, I was more than just a little jealous when Ruth unveiled her newly decorated study. I dream of not only of having a study of my own, by having a study of my own that looks just like this. I love it. Finally I'm heading over to Instagram and showing you an Interior fan who really excel in dark and moody. Pati Robins who, if you spend any time at all browsing for interiors on Instagram, you will undoubtedly have come across (she's also one of three contributors to the Style & Squeeze website). She's a pro at doing dark and dramatic, an absolute genius at DIY and champions budget friendly design ideas, plus she's probably the nicest lady on Insta. If you're not following her, you need to be. Her living room and hallway (see also her bedroom) are just perfect. She's used Black Heron in the living room and Tempest Teapot in the bedroom, both by Valspar. Dark walls, dark sofa, dark furniture, but with loads of bright quirky accessories and artwork. 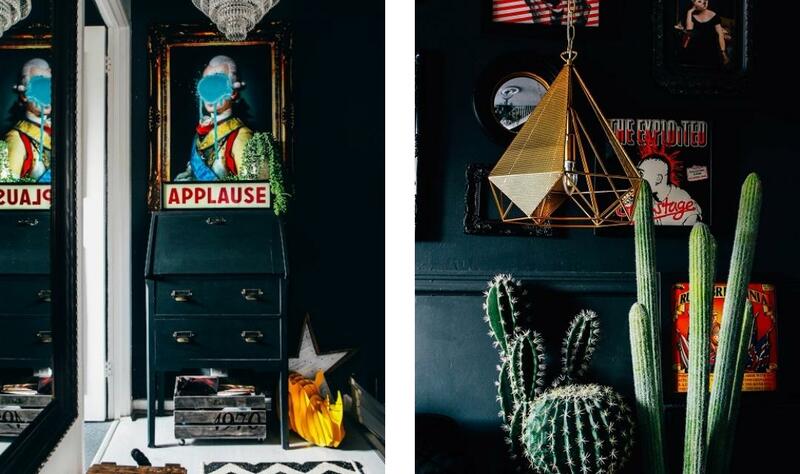 Her home really epitomises dark, moody interiors with a quirky, playful edge. I just love her! 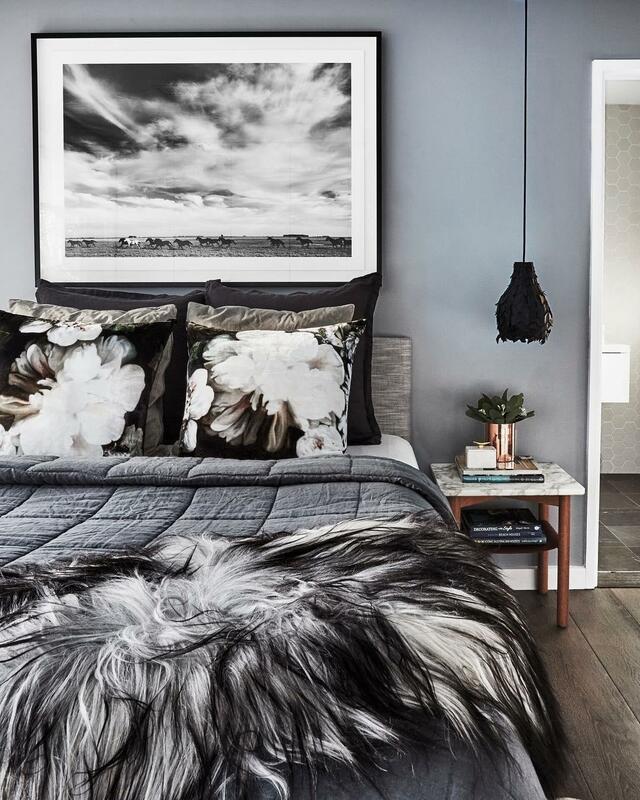 If you were already a fan of the darkside, or if these examples have been enough to pique your curiosity then head on over to our Pinterest board, Interior Trends: Dark & Moody for more dark and moody interior inspo.